This is an increased exposure and contrast version of this mosaic and gives an even better view of the comet's outflowing material. 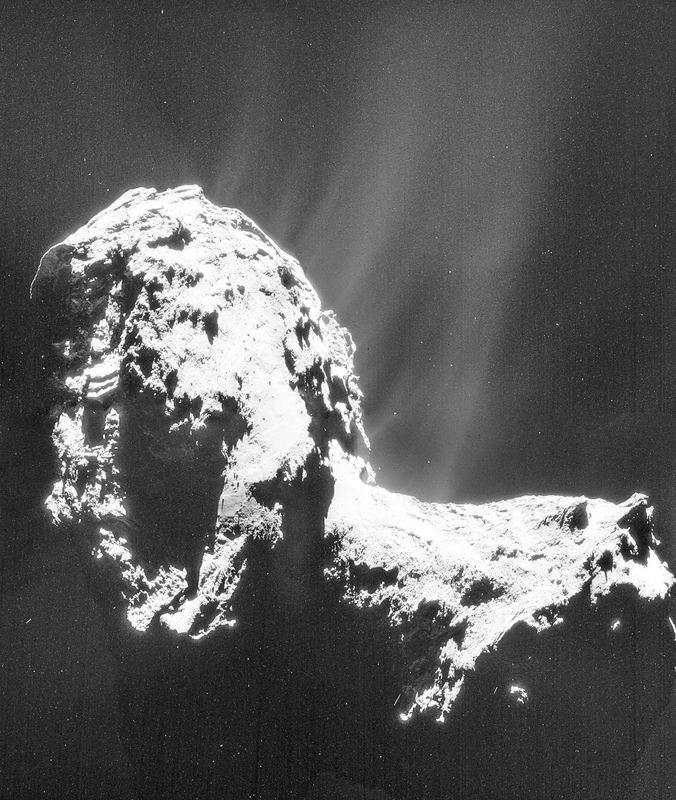 The mosaic is comprised of four images taken by Rosetta's navigation camera (NAVCAM) on 20 November 2014 at about 30.8 km from the centre of comet 67P/Churyumov-Gerasimenko. The four images were taken in sequence as a 2×2 raster over a short period af about twenty minutes, meaning that there is some motion of the spacecraft and rotation of the comet between the images. In addition, scattering in the NAVCAM optics can lead to large-scale intensity artefacts which are difficult to cater for when mosaicing. Thus, for this set of NAVCAM images, some pre-mosaicing masking and post-mosaicing localised intensity adjustments have been made to reduce the low-level artefacts. Post-processing in LightRoom was also used to bring out the faint outflows, while retaining the brighter features on the comet. The four individual full-frame images are also available as related images in the right-hand menu, which allow you to check the accuracy of the mosaicing and intensity matching. The mosaic has been slightly rotated and cropped and covers about 4.2 × 5.0 km.